A millimeter sized particle has struck a solar panel on the Copernicus Sentinel-1A satellite, according to the European Space Agency (ESA). The impact occurred on August 23rd and ground control was able to identify the target area, thanks to onboard cameras — the good news is that, as of this writing, the satellite's routine operations have not been affected. The only observable reaction to the strike was a sudden, but small, power reduction in the satellite's solar array, along with minor changes in the orientation and orbit of the satellite. Sentinel-1A was orbiting at an altitude of 700 km when the particle struck the spacecraft. Following a preliminary investigation, the operations team at ESA’s control centre in Darmstadt, Germany, suspected a possible impact by space debris or micrometeoroid on the solar wing. Detailed analyses of the satellite’s status were performed to understand the cause of this power loss. In addition, the engineers decided to activate the board cameras to acquire pictures of the array. 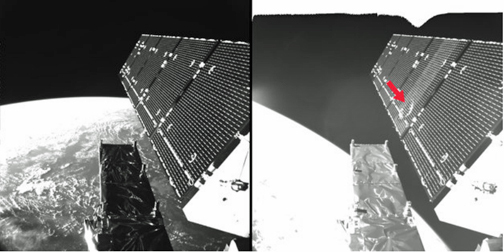 These cameras were originally carried to monitor the deployment of the solar wings, which occurred just a few hours after launch in April 2014, and were not intended to be used afterwards. Following their switch-on, one camera provided a picture that clearly shows the strike on the solar panel. Artistic rendition of the Sentinel-1A satellite. Image is courtesy of ESA. The power reduction is relatively small compared to the overall power generated by the solar wing, which remains much higher than what the satellite requires for routine operations. 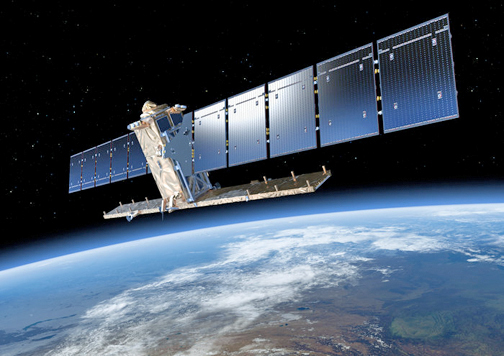 The Sentinel-1 satellites, part of the European Union’s Copernicus Programme, are operated by ESA on behalf of the European Commission.